If the Articulate tab on the PowerPoint ribbon is missing or some of the Articulate Presenter buttons aren't working, follow the steps below to enable the Articulate add-in and verify your Trust Center Settings. ​Tip: If you're using an older version of Articulate Presenter, you may see Articulate Presenter Communicator and Articulate Presenter Ribbon instead. Make sure both boxes are checked. Select the Trust Center tab on the left side of the window that appears. Click the Trust Center Settings button on the right side of the window. When the Trust Center opens, select the Add-ins tab on the left. If the box is marked to Disable all Application Add-ins, uncheck it. 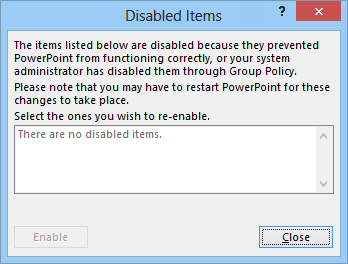 Click OK twice, then restart PowerPoint for the changes to take effect.